First, gather all your grocery ads. 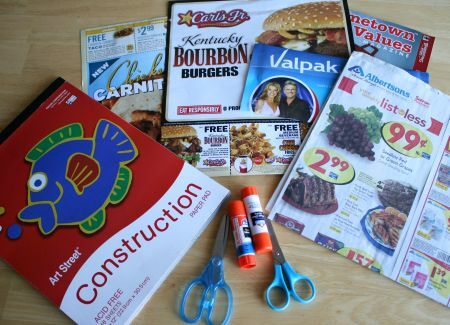 Let the kids look through and see what items might be good to have in their menu, then cut them out. If your child is ready to use scissors, go for it but with supervision if they're small. Or you can have them point to the items they want and you can cut them out. Next, fold a piece of art paper in half vertically. 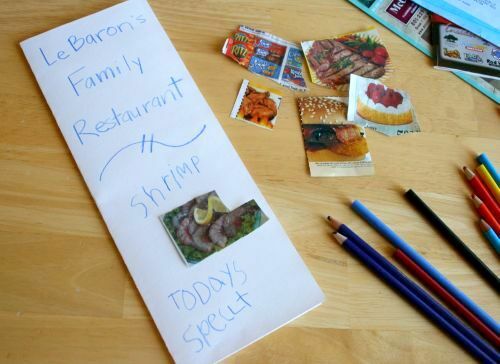 Glue the cut out food items onto the paper in a line. Now write in each price. My son loved making up how much everything cost. He wanted to make the steak "1 Free" and the ice cream is $20 because it's sooo good. We even named our restaurant, LeBaron's Family Restaurant, with "Todays Special" as Shrimp, my son's favorite food. Have fun playing Restaurant! Marie is a crafter, foodie, and mother of 3. She loves running, reading, and eating candy. Check out her blog Make and Takes for more Ideas and Crafty Tidbits for Home, Family, and Fun. I let me daughter do this all the time. She loves it! What a great use for grocery ads! This can also be used for older children too if they are learning a second language. They can make a menu in the language and have the food to help them learn the words or make flash cards with the pictures of the food. When I was teaching JH I did this with my students. I had them plan a thanksgiving menu, this was a great learning experience for them. 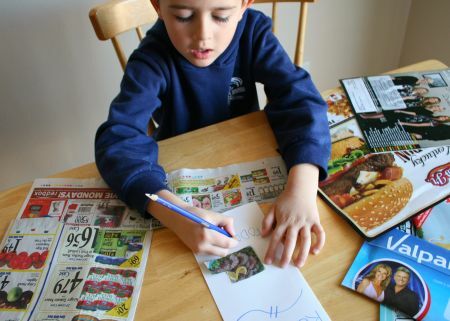 When your kids are older you can incorporate the price of the meal using the ads also. For those who are homeschooling, you could extend this idea by having them “pay for” their meals for practice in counting money. I love this! What a great fun idea! Cute idea! I love it! What a great idea!! My son is too young to do that right now but I hope I can remember it for later! Thank you for posting this! This is a great idea. 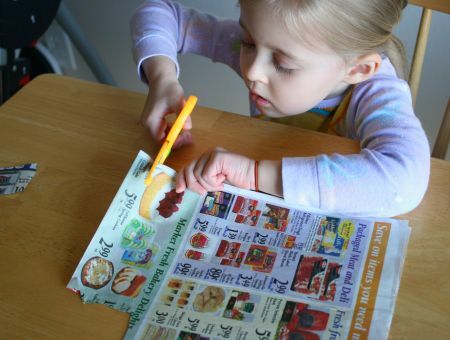 My daughter is 3 and we do a more basic version of this – she gets the Toys R Us ad while I clip coupons. 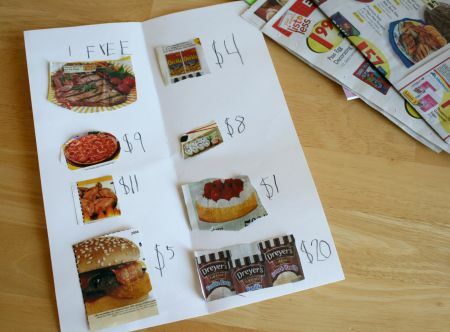 She cuts out “coupons” and glues them into a little flip book so she has a nice booklet of things she likes to look at. She ads to it most weeks. I have to draw boxes around the things she likes so she has lines to cut on. I think your menu idea would be a great “next step” for us once she matures a bit. What fun extension ideas to go along with this. I love the idea to use this with learning a second language. Or then talking about how to exchange money! Thanks for letting me guest post!! What a great idea! My daughter will love it. Thanks for sharing! You could also have older kids glue pictures in the shape of the “food pyramid” or glue them to a paper plate to show a balanced healthy meal, if you were working on nutrition. I teach kindeegarten and found this a great way to teach word recognition! I will take note!!! Such a cute idea! I love this little bit of fun “work” to keep my girl busy. She loves to cut and glue! Thanks for the fun! This is such a cute idea! I will definitely use this one for my next playdate!